Is Audi finally ditching its diesel platforms and embracing plug-in hybrids? We’ll let you decide. It’s hard to imagine such a turn around in so little time but AUDI has gone in 5 years to go from staunchly against electric cars, preferring diesels to now plug-in hybrids. Plug-in hybrids (PHEV) are a perfect stepping stone for the electric car conundrum. Frightened away by horror range fears from unscrupulous carmakers, buyers have had strange reactions to the electric car. One thing a plug-in hybrid does is that it extends the range of your electric drive only, giving drivers the best of both worlds. With this in mind, is Audi leaving its cherished diesel engine and now embracing a plug-in hybrid platform for its A3s? Audi, From Diesel to Electricity. In 2008, Johan De Nysschen, CEO of Audi's North American operations proudly said electric cars were not the way of the future. He based his point on how technology wasn’t ready and consumers either. However, at the time, Tesla Motors was building a fine little electric Roadster that pounded 240 miles out of its first generation battery pack, using commonly found laptop batteries. Six months later, Audi’s tune changed somewhat and De Nysschen became a little more flexible but still, diesel was the way to go forward, period. Audi Plug-In Hybrid’s Foray. By now, Audi realizes that the use of either an extra electric motor or using it 100% to help a car has serious energy and performance bonuses. 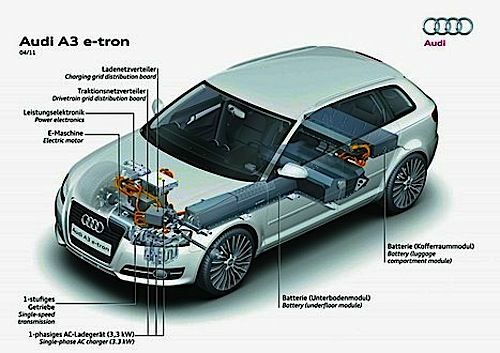 The brief “alternative energy car history” will show us how Audi has brought us a stunning electric car based on the R8 called the e-tron in 2009. After that, the next few years didn’t show much but a plug-in hybrid version of it with A3 electric and plug-in hybrid tests, discreetly done. According to the Geneva Auto Show, Audi told a panel of U.S. reporters at the 2013: “Of all the fuel-saving technologies out there, plug-in hybrids are the most viable in the long term,”. But full electric is still off the plans. Yet again, Reiner Mangold, head of Sustainable Product Development for Audi AG continues the stereotypical EV problems by saying that the carmaker has no plans for an all-electric production car: “There's too much limitation in range.” And again another carmaker believes faster chargers aren't what consumers want but without documenting his point. Audi feels drivers would rather “keep going” without pausing to top up the batteries. But pausing to refill gasoline is OK, somehow, as well as eating and more, I suppose. And lastly, as if we hadn’t heard that one too many times before, again fully unsubstantiated, Audi believes EVs to be viable will need a range of 500 miles. While we can’t fault every carmakers for missed opportunities, it’s fascinating to see big carmakers, such as Audi and Toyota still claiming electric cars are not ready, neither is the public, nor the charging infrastructure despite the contrary. In the meantime, we are happy to see more plug-in hybrid and Audi A3 PHEV will be a great addition. Remember that Audi is a subsidiary of the Volkswagen Group. I'd be willing to bet they aren't going to "ditch diesel" at all, but will have one brand focus on it while the other does electrics. This would mean they get into both in the market and get credit for both in CAFE and CARB. Yes, I think they finally realized they could gain greater market shares and a more positive image by catering to the hybrid folks. I consider that electric cars are still not economically wise for most drivers. However, this will change as battery technology improves and electric charging facilities become more numerous. Batteries have a very bright future. So much so, that electric cars will someday necessitate major new investments in electric power generating plants. I think battery technology is suffiently able to handle 80% of our US daily commutes, so the real priority is keeping costs down, not necessarily battery capacity. "But pausing to refill gasoline is OK, somehow..." It is OK because pausing to refill gasoline takes far less time than pausing to recharge an EV, and needs to be done much less frequently. When the 350 mile range EV with 5 minute recharge time is available, then that will be OK too. That is something I never hear from EV drivers. If you actually go to a Fast Charging station, you will witness something you never do in a gasoline station, people talking and exchanging EV stories with each other. I have yet to see frustrated people at a charging station as I see them a gasoline stations. Anyway, 20 mn is enough to get a cup of coffee, groceries or other quick stops.